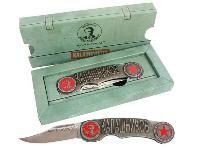 Cybergun Kalashnikov Pocketknife, Silver Patina Handle, Red Logo & Star, Non-Serrated Blade. Knives. 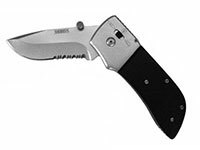 This Kalashnikov pocketknife is built with high-quality craftsmanship and care. The handle is made of zinc alloy and galvanically coated in silver. The Star and official logo are both coated with red epoxy. Each knife is made and assembled in Serbia with the approval of Mikhail T. Kalashnikov himself! Things I liked: great feel. sharp and ready to go out of the box! If you like AK's or like ol' Kalashnikov, you you WILL LOVE this knife. Things I liked: BIGGER THAN I EXPECTED, HEAVY SHARP BLADE, MEAN LOOKING LIKE AN AK!! Things I would have changed: NADA!